Sra Flowers’ Snapshot of the Spanish – speaking World is a new three term course offered this academic year in our World Language Department. This course will provided students the opportunity to discover and celebrate the uniqueness and diversity of the Spanish – speaking World. The students will be introduced to the 21 official Spanish – speaking countries of the world. The students will learn about these countries through research, readings, map studies and crafts. Currently, the students are learning and exploring the nine official Spanish – speaking countries of South America. As we complete this unit of study, the students were involved in a craft project. 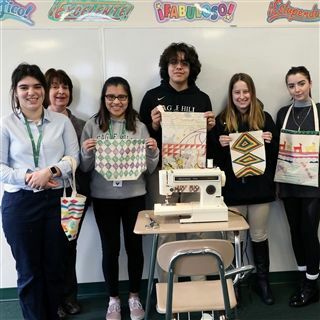 The students designed their own “Shigra” – a tote bag from Ecuador. Over several days, the students prepared their fabric by measuring and cutting according to specifications, sketched ancient/modern designs on the bag, applied color to their designs, and finally assembled their “Shigra.” They are now in the final stages of assembling their bags using a sewing machine. ¡BRAVO! to all the students on their excellent work!